En el mundo de Nightwalker, los ataques de los nightbreed, o raza nocturna, demonios menores que poseen a los humanos que se alimentan de sus almas, son relativamente comunes. Como grupo, los nightbreeds (o simplemente breed) son usualmente auto-serviles y de baja inteligencia, tiene la capacidad de poseer el cuerpo humano para cometer crímenes. Los crímenes cometidos por los breeds son difiles de identificar, una agencia especial conocida como N.O.S. ha sido creada para investigar y resolver los crímenes de los breed. La musica es de Akifumi Tada. 01. 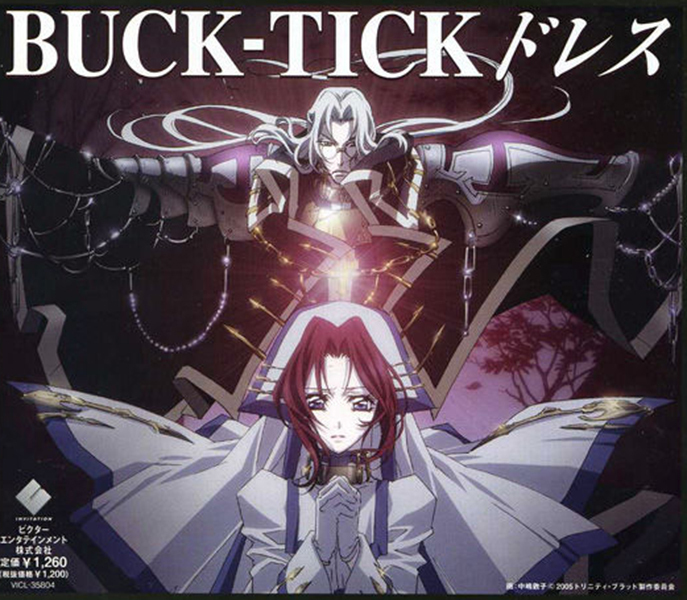 Buck-Tick – Gessekai (5:05), 02. La’Cryma Christi – Mirai Koro (4:15), 03. Avantitle -Joshou- (0:21), 04. Shidou no Theme -Yami wo Kuru Mono- (6:42), 05. Odayaka na Nichijou -Gogo, Jimusho- (1:41), 06. Riho no Theme (2:18), 07. Jiken no Yokan (3:10), 08. Yayoi Theme (1:25), 09. Hitokuse (2:58), 10. Breed no Theme -Yami ni Ugomeku Kurai Kage- (2:42), 11. Breed no Sasoi -Amai Yuuwaku, Soshite Hametsu- (2:49), 12. Shidou no Ikari (2:22), 13. Kessen -Yami to Yami no Tatakai- (3:47), 14. Jiken Kaiketsu (1:45), 15. Kain no Theme -Utsukushiki Aku, Taihai to Bi no Sasoi- (1:49), 16. Kanashiki Kako -Shidou no Nayami- (2:59), 17. Eien no Yami (1:26), 18. Buck-Tick – Gessekai [Instrumental] (2:15). 01. TB No. 45: Resolution (3:06), 02. TB No. 21: Kresnik (2:05), 03. TB No. 01: Departure (1:27), 04. TB No. 02: Reminiscence (1:35), 05. TB No. 18: Tactics (1:28), 06. TB No. 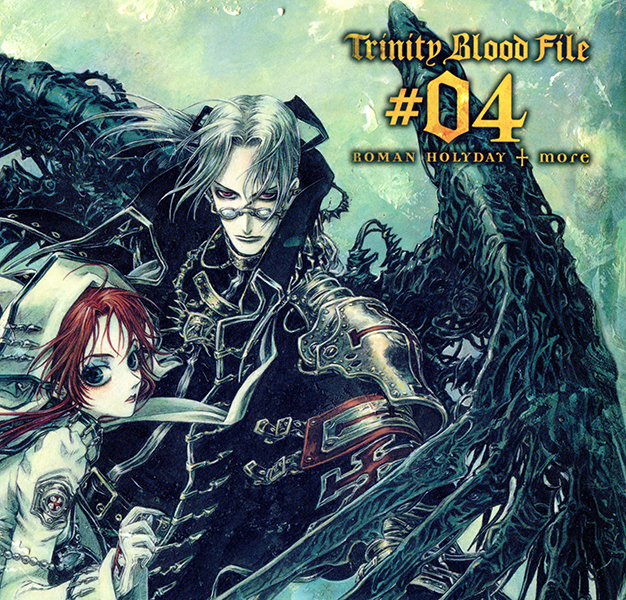 05: Trinity Blood (3:29), 07. TB No. 06: Clear Heart (4:02), 08. TB No. 12: Master of Darkness (1:17), 09. TB No. 14: Rosencreutz Orden (1:57), 10. TB No. 04: Despair (4:50), 11. Tane Tomoko – Let me Hear [Strings Version] (3:53), 12. TB No. 37: Conspiracy (2:25), 13. TB No. 19: Crisis (1:41), 14. TB No. 03: Tendreness (1:46), 15. TB No. 43: Heretic (3:54), 16. TB No. 23: Search Mode (1:29), 17. TB No. 36: Merry Moment (2:08), 18. TB No. 42: Albion (4:01), 19. TB No. 16: Assault (1:04), 20. TB No. 08: Grief (2:12), 21. TB No. 38: Wish (3:21), 22. TB No. 39: Betrayer (1:55), 23. TB No. 29: Broken Wings P (4:44), 24. TB No. 44: Cain & Abel (8:54), 25. Lisa – Requiem Inori (4:55). 01. Dress [Bloody Trinity Mix] (6:36), 02. Rokugatsu no Okinawa [Live] (3:55), 03. Yuuwaku [Live] (5:51), 04. Zero [Live] (4:04), 05. Dress [Live] (6:38). 01. 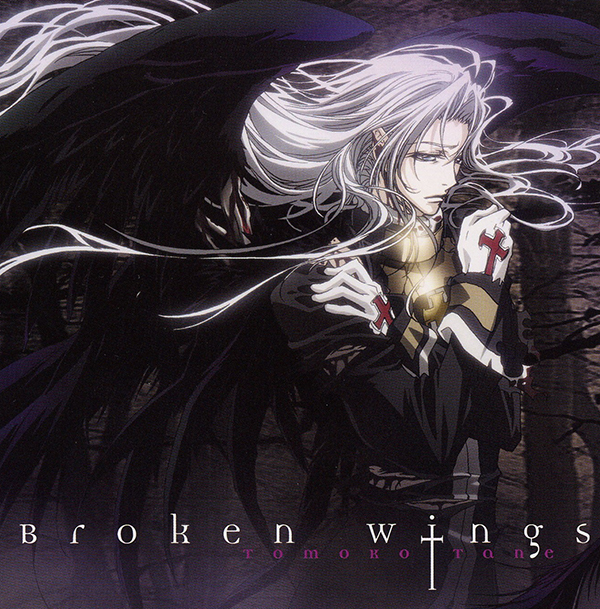 Broken Wings (3:46), 02. Let Me Hear (4:49), 03. Broken Wings [Instrumental] (3:46), 04. Let Me Hear [Instrumental] (4:46). Drama: 01. Nakai Kazuya – HC-IIIX (3:21) / Gunmetal Hound: 02. I. Beginning (7:04), 03. II. Invader (4:21), 04. III. Mission (9:52), 05. IV. Epilogue (3:31), 06. Coming Soon: TB File #02 (0:42) / Others: 07. TB No. 21: Kresnik (2:06), 08. TB No. 01: Departure (1:27), 09. TB No. 06: Clear Heart (4:02), 10. TB No. 23: Search Mode (1:28), 11. TB No. 03: Tendreness (1:40). Drama: 01. Abel Nightroad (4:43) / Guns´N Swords: 02. I. Burning Heart (6:15), 03. II. Partner (4:30), 04. III. Chaos (5:43), 05. IV. Parting (4:28), 06. Coming Soon: TB File #03 (0:40) / Others: 07. TB No.09 power game (1:34), 08. 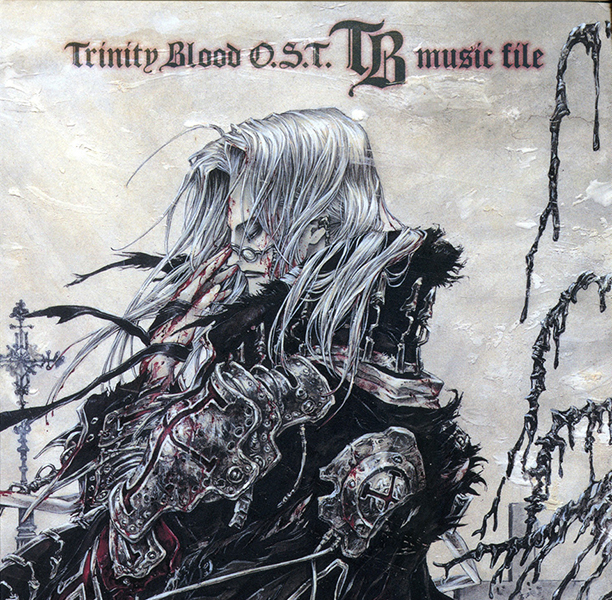 TB No.05 Trinity Blood (3:28), 09. TB No.17 battle (2:07), 10. TB No.29 Broken Wings p (4:42). Drama: 01. Rosencreutz Orden (4:51), / Radio Head: 02. I. Bachelor´s Pride (5:48), 03. II. Secret of the Doctor (5:32), 04. III. Xam (5:30), 05. IV. Tragedy (8:51), 06. V. Pale Bride (3:54), 07. Coming Soon: TB File #04 (0:37) / Others: 08. TB No. 18: Tactics (1:27), 09. TB No. 07: Hope (2:29), 10. TB No. 24: Carthago (2:45), 11. TB No. 25: The World of Methuselah (1:33). Drama: 01. Esther Blanchett (5:30), / Roman Holyday: 02. I. Fantastic Holiday (6:43), 03. II.A Kidnapping (7:22), 04. III. Sophia Letter (4:44), 05. IV. Parental Love (8:02), 06. V. Epilogue (1:35) / Others: 07. TB No. 34: Affection (2:45), 08. TB No. 13: Conflict (2:13), 09. TB No. 26: Treasure Moment (1:54), 10. TB No. 22: Sadness (1:16), 11. TB No. 40: Requiem Cho (4:14).